Subtropical / tropical direct seed erosion control for steep orchard? I'm trying to figure out something that can be direct seeded / scattered for perennial erosion control in a steep orchard. The context is Southern California, but i'm curious generally for anything that does well in subtropical or tropical areas. So far the best option for erosion control I can find is Vetiver grass, because its roots go straight down and are known to be very good for erosion control. But it rarely sets seed, so it can't just be scattered across an eroding hillside. Re: Subtropical / tropical direct seed erosion control for steep orchard? Let the weeds and grass grow naturally? All the hills are covered in weeds and grass here now with all the rain... Didnt have to put down seeds, nature took care of it. If you want to speed up the process and you or your neighbors have a weedy lawn spread the grass clippings on the bare hillside. The problem is that the hillsides I'm dealing with are so steep that the grasses are too shallow rooted to hold them, and the grasses only really have vitality for a few month period before they dry out and wither. So I'm trying to establish something that can hold the soil. Longer term oaks or something else drought tolerant with extensive roots would work, but they are slow growing. Do you have a pic of the hillside? My property is all very steep hillside. The majority of it is just the native shaparal vegetation. Sumac, scrub oak, salvia,... Its only on the spots I've cleared that grass and wild lettuce, weeds etc has taken over. You didnt say how many sq ft either. Is it 5000 ft or 100,000ft ? Heres one ornamental hill cover I am really fond of. It takes a few years to get it established though. i know lemon grass is not seed. But I think lemon grass would be great to control erosion. It has roots that dig into the ground once it is establish. and It can take the weather down in S.CA. And I think it is easy to plant as well. All you do is stick it into the soil. You can buy lemongrass seeds. The thing with lemongrass is its tropical and needs water in summer and gets cold damaged in winter. There are better grasses to use for our arid climate but most of them are highly invasive. Interesting. What is that ornamental cover called? The hillsides are very steep (probably steeper than 45 degrees) and small pockets like 4000 sq ft here and there. Its a type of ice plant. 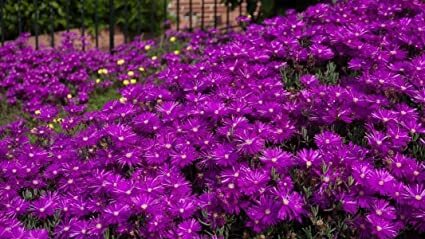 Its the neon purple one (delosperma). Its important to get the right ice plant if you go with that. Rabbits and deer will eat it all if you get the kind they like. They dont touch the purple one. Its ver easy to propogate. You just cut a 6 to 12" piece and stick it in the ground every foot or so. It roots and grows on its own and smothers out weeds. Then you can spread it as you get more of it. It has to be hand propogated though, its not like the ice plant on the freeway that creeps and sows itself. Heres a youtube video the guy talks about it for erosion control on hills. That steepness seems a bit much for an orchard. You might consider some earthworks like terracing on contour before investing in turning the plot into an orchard. My cousin who lives 20 mins away from me (unprotected frontyard) have a big lemon grass and never got cold damage. I personally own a small lemon grass on pot & we have been consistently been on the low 30s, 27 the lowest and i dont see no cold damage. I own the lemon grass for 2 yrs now. Ok my mistake sorry for that. It just seems very tropical and doubtful it will work out well on the side of a hill with no irrigation in CA summers. But maybe? There are certainly better grasses for that purpose. My neighbor has a lot of this clumping grass and it loves to sow itself on steep bare hillsides. So much so that I am costanly removing new clumps. Its very invasive stuff but it definitely has a very strong root system. Has to be dug out. Will take a pic of it later today. Not sure if this vetiver but it sows it self on steep bare spots. Its like natures fix for bare hillsides. It also spreads everywhere. Wish my neighbors didnt have it growing. It doesnt need any water and has super strong root system. Yep u are right... those r strong can survive drought and mid 20s temps as far as my observation to my neighbors yard. Check into perennial peanut. Drought tolerant and nitrogen fixing.